Blurb Description: With this stunning debut novel, New York Times bestselling author Lauren Oliver emerged as one of today's foremost authors of young adult fiction. Like Jay Asher's Thirteen Reasons Why and Gayle Forman's If I Stay, Before I Fall raises thought-provoking questions about love, death, and how one person's life can affect so many others. If you knew you had one day left to live, what would you do? Would you be desperate to live to see a new tomorrow? Would you try to make sense of the chaos your life is in? Or would you do the things you never thought you could do? Welcome to Samantha Kingston’s life. Everything is picture perfect- the popular girl with all the friends and wannabe friends and the boyfriend. The respect, the fear, the awe from her peers, her harmless jokes with her friends- I mean, who could it possibly harm, right? In a car crash one night, only to wake up the next all fine- with one catch. She didn’t wake up in tomorrow, but in yesterday! And nobody, except her, is any wiser. What would you do? Would you kiss someone? Would you bungee jump off a cliff? Would you stalk someone? Spend quality time with your family? Or would you just wait for this nightmare to end? 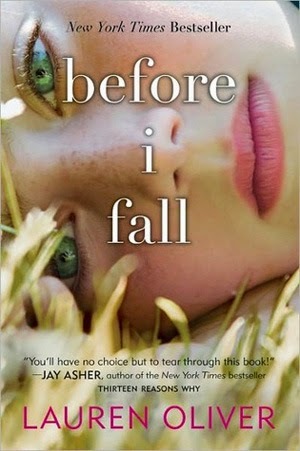 When I flipped open Before I Fall, I expected what anyone would expect from a NYT Bestseller- and Before I Fall delivered! It was the little things, really, that made me fall in love with this book- the small acts that Samantha did to help others; the way she saw how all actions have consequences, and that even the smallest act of kindness could go a long way. It was brilliantly written, gritty, deep and compassionate. I couldn’t give it a higher recommendation! DAY ONE: GIVEAWAY: 2015's BEST FANTASY BOOKS!